Les remorques fermées à Newton, KS sont légères, aérodynamiques et conçues pour offrir une plus faible consommation de carburant, facilitant le remorquage. Chaque année, des millions de familles utilisent nos remorques carrossées pour déménager. U-Haul offre une vaste sélection de remorques carrossées à louer dans la même ville ou pour un aller simple. Consultez les tailles de nos remorques fermées et réservez en ligne une location de remorque chez R Pro Tire! Les remorques ouvertes sont idéales pour le remorquage de charges grosses ou surdimensionnées à Newton KS 67114. De nombreuses remorques ouvertes sont louées avec une rampe de chargement pour plus de commodité. La sélection de remorques ouvertes offertes chez R Pro Tire représente une solution abordable pour des projets d’amélioration résidentielle, la livraison de meubles ou le remorquage de véhicules récréatifs. La location de remorque ouverte est également populaire auprès des entreprises pour la livraison et lors de salons commerciaux. Les remorques ouvertes sont offertes en une variété de dimensions et de styles afin que toutes les voitures puissent les remorquer. the personal was amazing, no improvement needed. I dropped off the truck on a Sunday afternoon, and was not sure where to park the truck. It was raining, and I did not want to get the truck stuck, and/or block an entrance to the building. Maybe a small sign near the key drop box showing where to park. Overall good! Customer service was lacking--no interest shown in reconciling the time of pickup and time to return which was less than the 24 hours I had contracted for. This was only settled satisfactorily by my calling U-Haul directly and speaking with a representative (Pat) who was very helpful. It was terrible from start to finish. Both uhal truck and storage lost my reservation in 6 separate occasions. When we finally found my original reservation it was under the wrong name and had half my too and half my from address. I spent about 4 hours on hold and about the same talking to people on he phone both in Kansas and Nevada. Unless you do something to make it right, I will NEVER USE YOU OR RECOMMEND YOU AGAIN!!! I’ve taken a week to respond to your request due to being that frustrated. I had to be on the phone while in the uhal with uhal about them losing my reservation. Does not help with a stressful cros country move! 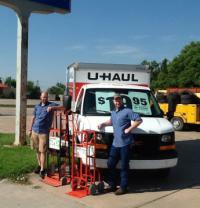 The days we have had to rent a u-haul are never fun for multiple reasons, but the folks at this location in Kansas are very knowledgeable, helpful, and friendly. They made the one-way multiple state experience a bit easier and a bit more positive. Of the places in Newton to rent a u-haul, we highly recommend this one. This is a place that is focused on being a tire shop. And that is fine but their customer service for Uhaul is not their focus. That's why I chose the other location in town to rent from. I visited both and the south location made me feel dumb for the questions I asked. However, Uhaul made me pick up at the south Newton location. There was trash in the cab and the windshield was not clean. I'm not sure how it works but we were told where to drop off our Uhaul, so I would assume the previous customer was told where to drop it off. This added extra time and frustration (and distance) to our moving day. I hope that future people are allowed to pick up at the location they reserve. Don't change the location to over 60 miles to pick up a truck. Make sure that the location they pick up has the truck. The truck was awful, we have rented before but will NEVER use U-Haul again. The place was slammed with people so we had a wait quite awhile to get help hitching up the trailer, but Roger was super kind and professional. Good experience on both ends of the trip. Well done. Will was very professional and helpful. He made the experience very easy and pleasurable. He helped me hook up the trailer and ensured all lights were in working order. I will absolutely recommend this location and service to friends and family. Has a loose inside rubber bumper. Was clean. Loose door seal. Actually have the piece of equipment at the original place that I reserved the rental at, McPherson, KS, I had to drive about 60 miles out of the way and then go to another rental place to the furniture pads. Rear Duals on passenger side were at 30psi, 50# under pressure and another front tire was low. Had to add quart oil at first gas fillup. Very helpful with the return process. Easy and convenient. While the equipment was clean and pretty well maintained, we had to stop once or twice on the way to KC to check the hitch and tighten the hitch to the ball portion. Seemed to wiggle loose. Definintely not safe and should be double checked on this unit. Otherwise was great. Get some new trailers, ones with swing open doors. The connection between uHaul and the community locations is challlenged. I've rented trucks and trailers over the past few years and there is a disconnect somewhere. On this occasion, I had registered to pick up a truck at 5:30pm. I received a confirmation from uHaul about this location, truck, and time. I was double-checking and called the location in Newton to confirm. They informed me then that they are not open at 5:30 and that would not be possible. I rushed to pick the truck up early. This posed some problems for me though. My help was planning to start sometime after 6pm and I had a 6-hour reservation to return the truck by 11:30pm. I had the truck early but no help that early. So, I ended up needing to bring the truck back later than planned. We brought it back about an hour late...and was charged for 2 full 6-hour rentals. I am discouraged about this and would like to know who to talk to. Thank you.